After overachieving Nets make the playoffs, a stronger fan base and a lure for free agents. But Brooklyn won't go back to Dodger-land. The Brooklyn Nets overachieved, this past season, exceeding expectations and making the playoffs. They even won their first playoff game, on the road in Philadelphia, then lost some tight games before being defeated soundly two nights ago by the 76ers, a team with more size and more talent. Still, the Nets have established an identity and a culture, in contrast with the grotesquely mismanaged New York Knicks, and that could help the Nets land a major free agent (like Kevin Durant) in the offseason. The team, wrote the New York Post's Brian Lewis, "could look completely different next season." Plus: New York. In April 2018, as I wrote 4/26/18, the Commercial Observer's always debatable Power 100 list ranked the three L&L MAG founders, including former Forest City New York CEO MaryAnne Gilmartin, at 26, which I thought premature. Now that they have a couple of projects going, in Chelsea and Long Island City, plus other milestones for the larger parent company, they've risen to 17. Gilmartin was 43 in City & State's more recent inaugural Real Estate Power 50, while Greenland USA CEO Hu Gang was ranked 27, which I found debatable, given his company's general caution toward development. Indeed, now that Greenland is selling even more pieces of Pacific Park, it's notable--and understandable--that Hu--who ranked 42 last year on the Commercial Observer list--is not in the publication's latest list. But there are several parties with Atlantic Yards/Pacific Park connections. Update: the press release, at bottom, indicates 258 units of affordable housing--which was announced in March, actually--but otherwise adds no insight. 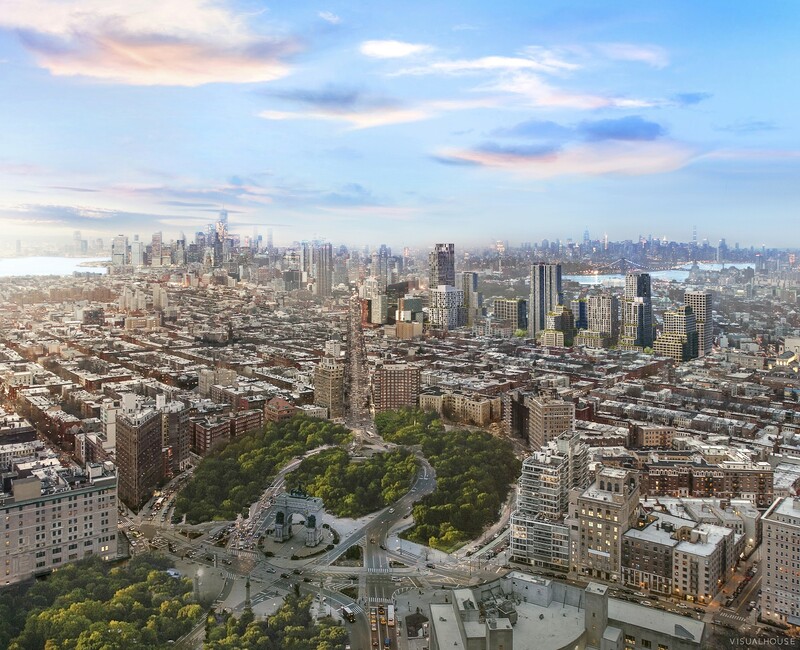 Brodsky Organization doubles down on Pacific Park complex wrote the New York Post's Steve Cuozzo late last night in another scoop--remember, he was fed the exclusive last September when Brodksy and TF Cornerstone bought development rights at three sites. What precisely that means is unclear. The deal to join Greenland Forest City Partners (95% owned by Greenland USA) to jointly develop 18 Sixth Avenue, the 859-unit tower (aka B4) at the northeast corner of the arena block, does not necessarily "accelerate progress at Pacific Park," since GFCP had already said that's on the way. New evidence I've seen suggests that immigrant investors in "Atlantic Yards III," the third round of fundraising under the EB-5 program, were provided misleading information by the U.S. Immigration Fund (USIF), which packaged the $100 million loan, and perhaps by the developer, Greenland Forest City Partners. It has to do with a misleading and already out-of-date map. That map of the potential project buildout, dated June 30, 2014 and shared with investors in October of that year, estimated that the final tower would open by February 2022. That would have been an astonishingly fast pace, with 14 towers rising to completion in less than eight years, including six rising from an expensive, elaborate platform covering the Vanderbilt Yard. Brooklyn retail rents are “starting to flatten”: REBNY, the Real Deal reported 4/18/19, citing a new report from the Real Estate Board of New York, noting that rent increases were visible along "Flatbush Avenue between Fifth Avenue and Grand Army Plaza in Prospect Heights," which is, of course, near the Barclays Center. Actually, if you talk to people in the know, or just look at the empty spaces at the Barclays Center perimeter and down the block at 461 Dean and Heritage Dean Street, it seems like a very mixed bag, especially since the report assesses asking rents, not actual rents achieved. Now that the New York Islanders have made it to the second round of the playoffs, the home games will be, as planned, at the Barclays Center rather than the Nassau Coliseum, which. as the team--approved by the NHL--announced in February reflected "that the Nassau Coliseum does not qualify as an NHL major league facility." So why was it at Nassau in the first place? Because the fans wanted it, the operators of both arenas (BSE Global) wanted it, the players probably wanted, and Gov. Andrew Cuomo wanted it. But the league wants Barclays, which has many more suites, when the games are full.